The Bears have reached T20 Finals Day for the first time since 2003 and will face Surrey in the first semi-final inside a packed Edgbaston on August 23. Colin Povey has warmly welcomed Warwickshire’s long-awaited upturn in Twenty20 cricket on and off the field. The Bears have reached T20 Finals Day for the first time since 2003 and will face Surrey in the first semi-final inside a packed Edgbaston in nine day’s time. Meanwhile the club’s strenuous efforts to market the tournament and it’s new Friday-night format appear to have worked with a reported 55 per cent year-on-year increase in ticket-sales for the group matches. 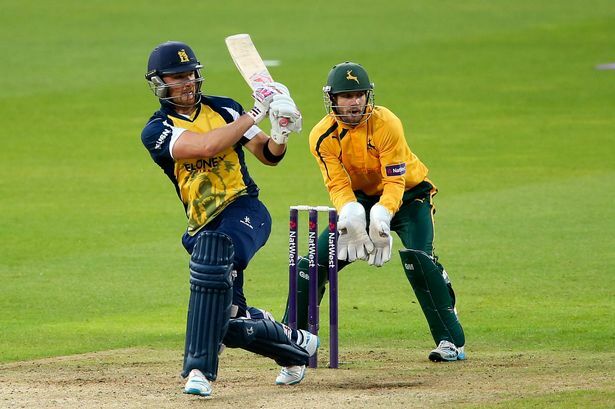 The club’s T20 revenues are up around 30 per cent with the lucrative Finals Day still to come. Happy days, at last, then for the Bears in county cricket’s shortest format. But while pleased by the turnaround, chief executive Povey insists there is more work to do with greater scope to attract bigger crowds to T20 games next season and beyond. “Revenues are up around 30 per cent year-on-year,” he said. “And ticket sales and attendances were up around 50 per cent despite us having two Friday-night games washed out and two games that clashed with World Cup football. We had the best crowd for the Worcestershire game for eight years. “People have worked very hard behind the scenes and it helped that this is the first year for some time that we had a clear run at it. We had the new Pavilion End opening then the Champions Trophy so this year we have had a clearer run and that certainly helped the commercial team. “But there is scope yet for us to get it absolutely right. The more people we pull into the ground, the better the atmosphere and that changes the whole mood so we have got to look hard at this volume and value conversation ahead of next year. As Warwickshire consider how to best exploit their Twenty20 resurgence, among matters for discussion is whether they continue to play in the tournament under the name ‘Birmingham Bears’ which they took this year to indulge Birmingham City Council, who lent them £20 million to rebuild the Pavilion End. The name-change was not part of the loan agreement but was “requested” by the council. Having supported the Bears with all that dosh, clearly the council is entitled to something in return but what a shame they could not have thought of something less disrespectful to the club’s history and its many supporters beyond Birmingham. The club is hardly in a position to refuse, of course. And Povey reckons they will stick with the new name in 2015, insisting that it has even helped “open doors” with some sponsors. “I don’t think we will be chopping and changing,” he said. “We have seen enough positives this year to sustain the name in the competition next year. We have to try to build on the Birmingham brand and try to engage with more and more new fans and I think that’s a decent vehicle for doing that. “I do think the Birmingham tag has helped us start to open doors with corporate Birmingham. We have had two or three good nights of hospitality and it has opened us up to some of the other Birmingham communities. “A small number of people think it is the worst thing that could ever happen to the club, but we have said from the outset that we see it not as a silver bullet to fix all the problems but one of a number of initiatives that we see taking this format to a new audience. “We have got more members than we had the previous year so it has clearly not been a disincentive for people to take memberships or attend games, despite some of the static on the screen. I hope people can take it for what it is – part of an experiment to try to take us forward.